Latest Experiment – Attempting to use NO wire in deep foundation-less frames. Earlier in the week I had a post on experimentation. This is the one I will be working on next. Problem: For two years, I have been stringing hundreds of foundationless frames with wire to give the wax extra support. Why???…. because, people on the internet did it that way. 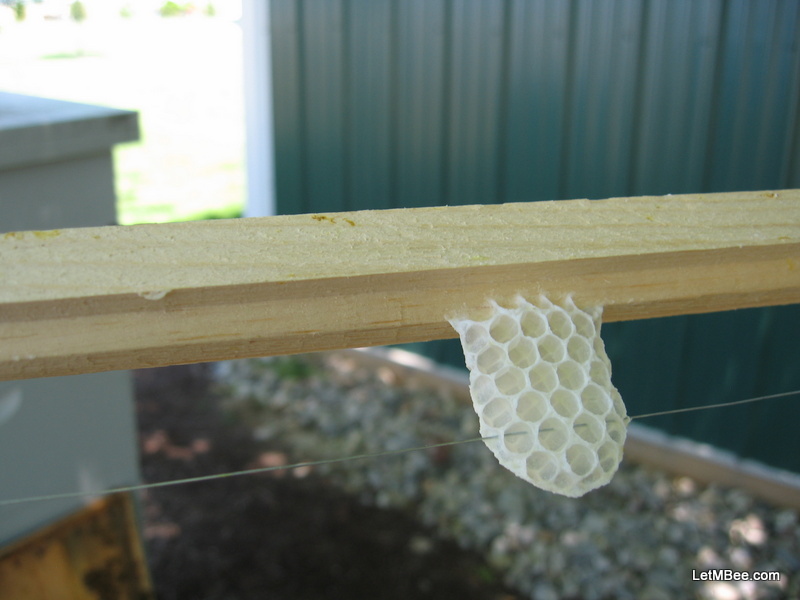 The bees draw things out perfectly, but the queen refuses to place eggs in the cells located where the wire goes across the frame. This causes a line to be skipped in the brood pattern every place there is a wire. Sorry I don’t have pictures at this time. I think they will eventually use it for honey storage, but I don’t like having cells in there that the queen is unhappy with. I believe the reason this is happening is that the holes drilled in the sides of the frame are not consistently centered. I can see it without measuring, but for the sake of this post I will show the frame with measurements. It is all metric because I felt it would be easier to display. I believe when the queen is inspecting those cells she is aware of the wire in the bottom of the cell and skips it. The evidence: The top two holes were compared to the top measurement of 28mm wide (28/2=14mm = center). All holes were measured on center and only one of them was true center!!! The top Hole #1 = 16mm, Hole #2 = 15mm. The bottom two holes were compared to the thicker portion 35mm wide (35/2=17.5 = center) Hole #3 = 18.5mm, Hole #4 = 17.5mm. Experiment: What will happen if I don’t wire deep frames? There’s only one way to find out. A beautiful section of comb started on a foundation-less frame WITH NO STARTER STRIP AT ALL. Logic: There was a time when I used to apply a wax starter strip to my foundationless frames. A comment on one of my YouTube videos stated, “this step is not necessary…..” I asked myself… “if it is not needed why do people do it?” Instead of discounting the comment I tried it AND YOU GUESSED IT!!! It is NOT necessary. At least if you are using the foundationless frames sold by Walter Kelley Company anyways. I get no money from them, that is just where these frames came from. It got me thinking…. I wonder what other unnecessary activities are occupying hours and hours of my time? Method: From this point forward the rest of the swarms caught in 2012 will be hived in two deep boxes. The bottom box will contain 10 un-wired foundationless frames. The top deep will contain the contents of the trap (the bees) on wired frames. The traps either hold 6 or 8 frames. The remaining frames to fill out the top box will also have NO wire unless there are pieces of comb removed from the lid of the trap. Those pieces of comb will be rubber-banded to frames that have wire on them, because the wire helps to hold the comb in place until the bees can attach it. None of the test hives will be moved post hiving, at least until next spring after the combs are inspected for strength. Frames that are put in swarm traps will be wired, because those are moved to their ultimate location. I don’t want comb coming lose in transit. I hope this won’t be news to anyone, but none of the bees in these trials will be fed. The first subject in this trial will be the colony in Trap 25. They will be hived most likely Friday afternoon. Any predictions on what’s going to happen? This entry was posted in Experiments and tagged bee, beekeeping, foundationless frames, Indiana beekepeing, Jason Bruns. Bookmark the permalink. 10 Responses to Latest Experiment – Attempting to use NO wire in deep foundation-less frames. I was in a mad rush this year to get equipment togeter (getting 2-3 swarms a day for about two weeks) I didn’t have time to wire or even put foundation in one of my grandpas wedged top split bottom frames I just threw them in the deep and put the bees in. From what I can tell by looking threw the screened bottom board they are drawing comb just fine the real test will be later this year before winter to see if all the comb was built correctly. I just added a deep underneth this deep with a combinaiton of foundation frames and wired foundationless frames. So you can count me in on this expierment. Nothing will happen Jason 🙂 the only thing that might happen is your comb might fail during extraction (if your turning them to fast), I think wires are used because wax foundation tends to slump before it is drawn out and to improve centrifuge strength, I don’t use wires on my warre frames and they are deeper then your deeps 🙂 As to comb straightness idk I was using nine frames in my warre boxs last year until I switched to eight, the spacing for eight is 37mm center to center, this seems to work much better then nine (cant remeber the c to c for nine frame). Your results will be interesting on comb straightness though, GO BEES! I agree Sam. Laying it out and taking pictures will help others believe though. As with not feeding and bottom supering this is something that I am certain will be ok. I just feel the need to show it. With the Warre style plans I have for these deep boxes I will be extracting from them eventually. I “think” that if those combs are in there for 2-3 years prior to extracting from them that comb strength will not be an issue. If one tries to make the combs fail in the extractor they will surely succeed. 🙂 There is a saying in pharmacy that is associated with medication dosing and titration. “Start low and go slow”. That is exactly what I am going to do. And if I have comb strewn all over the inside of the extractor…… I will take pictures. It kind of looks like an unwaxed starter strip there, the wooden slat protruding from your top bar. It is just a raised area on the bottom of the top board. I have had similar results from taking the wedge from a wedge top frame rotating it 90 degrees and nailing it to the bottom of the top board. It works. I’m using all mediums in my hives (a choice made to reduce strain on my back and keep everything interchangeable) and no wire in my foundationless frames. So far so good. (Err…is 3 months of data enough?) I might try extraction next year if I can borrow a spinner and see how it goes. Otherwise I’ll just be making cut comb and doing crush and strain. All mediums is something I considered doing for a LONG while. At this stage of my life (I am fairly young and I have limited funds) all deeps make sense. If I didn’t want to build up as fast as I hope to I probably would have went the all medium route. I have some hives that I am trying to get to all mediums just to see if I can manage them better than the 3 deep configuration. I may say some things in my blog that may get under some people’s skin a little, but I only do it to try to get people fired up enough to think about thinks. A lot of beekeepers are far too opinionated, to the point of being closed minded. I may disagree with another beekeeper’s ideas, but if they are able to accomplish something I haven’t I must at least think about it. I am a fierce opponent to feeding, but I won’t hold it against others because I used to do it. I am on three years and I can say I don’t have enough data. I don’t know if you read my piece on records or not. The better records you keep the easier things will get. I still have difficulty to understand why brood combs need wire. Honey combs need extraction so wire helpful but brood comb needs it not. I feel fortunate to have began keeping bees in top bar hives so I never developed the habit of wires and foundations. My ladies freely build natural comb. One can super the top bar hive and even use foundation and wires if one wish but the brood nest is way too sacred to be burdened with such human gadgets. I agree with you completely. I don’t even open the brood nest on established hives and don’t feel the need for wire anymore. Also I can tell a difference in the excitability of my bees the deeper I go into the stack. The deeper I get the more it stresses them, I can tell just by the sound they make. Some may call that crazy, but I say any Beek who has been around bees very much would have to understand differences in tone during hive inspections.